Is located in Moncalieri, at about 7km from the city of Turin. Thanks to an efficient motorway link, we are at few minutes from the ring road Turin-South and from the old town Moncalieri, where you will find restaurants with typical menus, trendy shops and historic buildings. From here you can easily reach thousands places of historical, artistic and cultural interest of the real Piemont! To reach easily our B&B we recommend you to follow the directions for the ring road Turin-South and take the exit “La Loggia”. Turn left towards Moncalieri, then at the first traffic light turn left on Village Tetti Piatti / Tagliaferro. At the end of this road, you will find the directions for the Village Tetti Rolle. then turn right – We are in Via Vinovo 54bis. If you have problems you can call us: 340/3164430 or 347/5987939. From Turin Caselle “Sandro Pertini”. 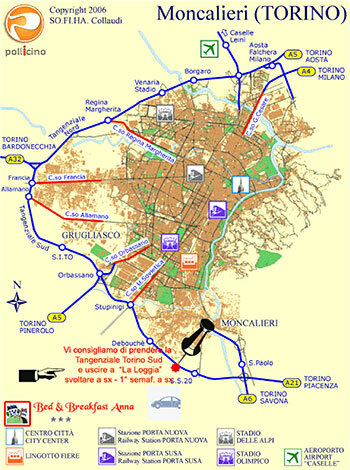 40 km to reach the B & B Anna from the airport, the more comfortable that we recommend is a minibus bus for Porta Nuova Station, then take the bus 67 stop Moncalieri, and continue with minibus 82.Public tranports. From Porta Nuova station, take the bus number 67 and get off at Moncalieri Borgo Navile.